In the morning, the group re-connected after the two-week interval. To start, the forum spent time deliberating on how Transport Canberra and City Services (TCCS) should engage with the community into the future. 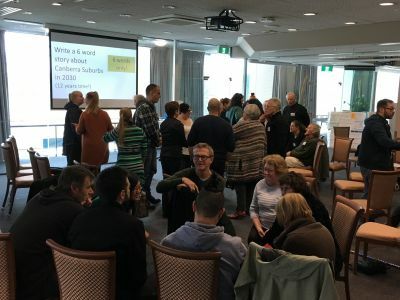 People reflected on their experiences with government (both positive and negative) and considered what would make a great relationship between the ACT Government and the community. Next, Ben McHugh spoke to the group about the overarching goal for the Better Suburbs Statement – to lead to a community centred approach to city services and an engaged and active community. He detailed the process for the Statement after the Forum, for the Statement to be tabled in the Legislative Assembly, and for action plans and reporting tools for each city service to be developed. The group then deliberated to move closer to agreement on the recommendations for all of the 14 city service areas. Seven groups were formed to work on sets of recommendations of two city services each. These were paired as they had clear connections with each other. After further discussion and review of TCCS staff feedback from each of the city service areas, the groups spent the afternoon finalising their sections of the Statement. Ten new members joined the Better Suburbs Forum for the Play Spaces day. In the morning, Greg Mews from Urban Synergies Group made an inspiring presentation on the value of play spaces for children’s health and development and provided an overview of the health challenges facing the new generation due to decline in free and independent outdoor play. Owen Earl and Stephen Alegria spoke to the group about the current management of play spaces by TCCS and challenges with maintaining the relatively high number of play spaces across Canberra, many of which are ageing. The group then heard from four community members that have coordinated petitions to the ACT Government. Elizabeth Hoyt from Waramanga, Nesh Nikolic from Torrens and Rollo Brett from Farrer have petitioned for play space improvements in their suburbs. Matthew Armstrong has petitioned for more fenced play spaces across Canberra. The forum members then spent time in groups reading and summarising themes from 17 community submissions provided to the Forum from stakeholder organisations. Discussion led on to why play spaces matter to Canberrans. The forum then split into smaller groups to work on criteria for a range of possible spending categories for the $1.9 million in available funding. Some groups also worked on overall priorities for play spaces in Canberra and how the community and TCCS should work together in making decisions about play spaces. Minister Fitzharris arrived at the end of the day. The forum members handed the draft Better Suburbs Statement to the Minister. 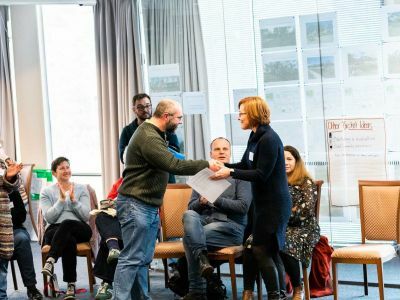 Many forum members spoke about the value of their experience with the Better Suburbs Forum and how the group had worked together with respect and dedication to achieve the Statement. The Better Suburbs Statement will be tabled in the Legislative Assembly in the next few weeks, after which it will be shared on YourSay. The group also provided an update on the play spaces forum and the deliberation so far. 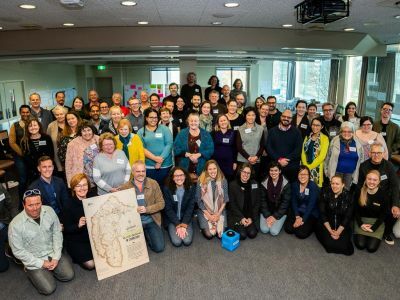 The majority of the forum members expressed interest in further work on play spaces to reach final agreement on a priorities framework for play spaces in Canberra and the allocation of funding. YourSay will be updated on the next steps in this process.